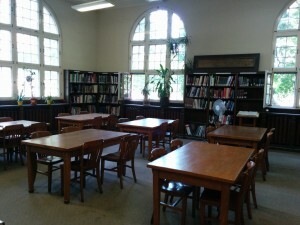 The Reading Room is an elegant choice for your book launch, author signing, product unveiling, or awards presentation. With high, arched windows and beautiful wooden architectural details, the Reading Room on the main floor will accommodate approximately 50 people. During regular library hours, the Reading Room is reserved for public use, but is available for rentals after library hours: Mondays and Wednesdays after 8pm, Tuesdays, Thursdays and Fridays after 6pm. Please enquire about week-end availability.